COUNCIL BLUFFS, Iowa—Sen. Elizabeth Warren (D., Mass.) charged onto the stage at a west Iowa bowling alley Friday evening, sounding almost out of breath before she began speaking. She was ready to go, and Democrats itching for a leader roared their approval. 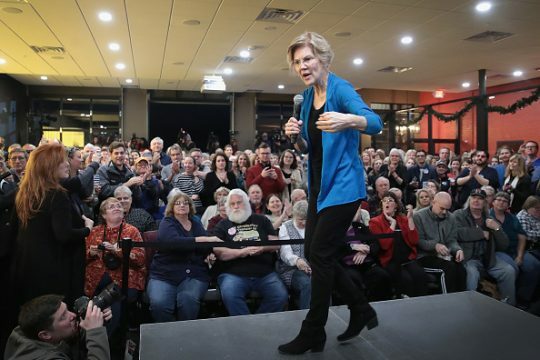 Just like that, the 2020 primary was officially on, with the 69-year-old scourge of Wall Street beaming and throwing her hands in the air in front of an overflow crowd of 500. "These are dangerous times for our country, and Iowa is going to have a big part in determining where we go next," she said. The man she would almost surely face if she emerges as the Democratic nominee, however, was scarcely mentioned. Warren didn't say President Donald Trump's name once, and only the last questioner of the evening even brought him up. Warren hit plenty of familiar populist notes in her remarks at the organizing event, telling her family story of growing up in Oklahoma, slamming the system as rigged against the middle class, and blasting "corruption" in Washington. "Right now, government works great for giant drug companies," she said. "It just doesn't work for people trying to fill prescriptions. It works great for giant oil companies that want to drill everywhere. It just doesn't work for families that want kids who can actually breathe the air." "If you're content with government working for the rich and the powerful, keep voting Republican, but if you believe that government ought to work for all of us, then I think that's what the Democratic Party should be all about," she said to loud cheers. Warren stayed relentlessly on her rigged system message, even turning a broad question from the audience about foreign policy into a pivot to economics. "One of the biggest threats we face worldwide is the rise of autocracies, of these powerful—I'm going to call them dictators although some of them may technically be elected," she said in what the crowd gleefully took as a Trump reference. "I'm just saying," she added. "Why does that happen though? Why is this happening around the world?" she asked. "The answer ties to the economic issues that I've been talking about. Decades of undercutting working families here in the United States of America, around the world, and the rise of the oligarchs." The only awkward moment of the evening, besides a brief microphone outage, came when a former law student of Warren's brought up abortion. Calling herself a conservative who nonetheless supported the progressive Warren's candidacy, she expressed concern over Warren's support for abortion rights and whether it would alienate too many pro-life voters in midwestern states. As she continued to speak and mentioned the recent death of her son due to cancer, the crowd grew impatient. "Ask the question," a man grumbled. "I know these are very hard, personal, family decisions," Warren said. "I think the role of government here is to back out." While Warren sidestepped any mentions of Trump, of whom she has been a voracious critic, the 45th president was on the top of the minds of her onlookers. Iowan graduate student Alaina Pfenning told the Washington Free Beacon she was impressed by Warren's focus on student loan debt, but she wasn't sure if progressive purity in the eventual nominee was more important than whether he or she could topple Trump. "I think it's more important to me that they are intellectual and know what they're talking about and make decisions based on facts and can improve the country rather than destroy it, as we currently are," she said. Others had no qualms about the question, like retired scientist Lori Bliss, an Iowa resident for 20 years. "Absolutely," she said, when asked whether defeating Trump was the top priority. "He's a lunatic." "[General William] Sherman had all the buffalo killed in the midwest to exterminate the Indians," she said later. "That's almost happened to people of color in this country and people who don't have good educations, people who are just barely thumping along, and that's not how you clean up a country." "At this point, whoever can beat him, we've got to get him out. We've got to get him out," Democrat Suzanne Neilson said. "We're for anybody but Trump. We would literally vote for anybody," said Neilson's boyfriend Gary Dial, an independent who called himself fiscally conservative. No one the Free Beacon spoke to was completely sold on Warren, and Neilson took her to task for her botched DNA test rollout where she revealed a distant Native American ancestor. Trump has long mocked her as "Pocahontas" for her claims of Native ancestry. "I think it's a shame that she has made anything about this American Indian heritage," Neilson said. "I think it's too bad she ever brought it up. It was kind of silly." Warren still has events in Iowa on Saturday and Sunday. Iowa has been a strong indicator in modern times of who will be the eventual Democratic nominee in open primary years. Hillary Clinton (2016), Barack Obama (2008), John Kerry (2004), and Al Gore (2000) all won the Iowa caucuses en route to clinching their party's nomination. "I'm just excited to be here with the people who are ready to get into the fight, because I'm sure ready," Warren told reporters afterward. This entry was posted in Politics and tagged 2020 Election, Elizabeth Warren. Bookmark the permalink.